PT. IMC TEKNO INDONESIA (formerly PT. ISHIKAWA INDONESIA) since its establishment since 1996, always committed to respond to customers’ requirements, and we are consistent to pursue the continuous production of precision plastic products that will made the customers feel safe. We produce and supply injection molding plastic parts as the exterior products and precision mechanism parts, mainly for the engineering parts. We supply for the product mechanism parts mainly extended for motorcycle, automotive, electronic components and also plastic parts for audio and video etc., precision connector, motor parts, etc., we also deal with the product variety of pharmaceutical appliances, air pump, files, transformers, etc. 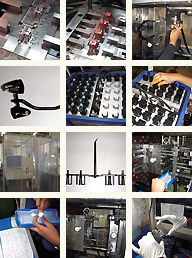 In addition we are also able to process by using insert molding. With all the local staffs and three persons Japanese engineer work cooperatively, every day, to respond to every detail of customer inquiry.